Dedicated to Rajani Palme Dutt, internationally known Marxist-Leninist theoretician of the Communist Party of Great Britain and Editor of "Labour Review" from its founding in 1920 until his death in 1974, the indefatigable Ernie Trory has continued his insightful examination of the roots and events of the Cold War during the 1950s. 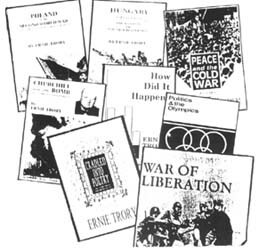 Trory brings to the reader a treasure trove of intense, challenging research and explanation of what really underlay the shattering history and weakening of the massive struggles to build and advance Socialism, as the interim era leading to the elimination of the blood-stained capitalist system and the historic emergence of classless Communist society. The history he lays bare has not only set back that struggle, particularly with the downfall of the Soviet Union; it has as well robbed succeeding generations of humanity of unlimited opportunities for cooperative, creative life on our tiny space ship called earth, and confronted us all with intense and looming dangers unparalleled in all history. Thus the writer in this work deals with more than some abstract of history. He deals head-on with current reality in political, economic, social, historical and cultural terms. From that standpoint the book has a ringing relevancy and highly developed interest and excitement that calls for the widest possible readership and circulation. Trory's work is a bold and deeply thought-worthy expedition down that road. The book in fact is a popular and historic study of the political struggles that ensued after Stalin's death and in fact preceded it. From Kautsky, Bernstein, Trotsky, Bukharin to Gorbachev and the deliberate downfall of the USSR can best be described as the "Politics of diversion, division and the obscuring of what Marx, Engels, Lenin and Stalin and the CPSU(B) backed by the heroic Soviet people, fought for and accomplished". Who was correct in the post-war period when it was stated "the class struggle will sharpen"? Was it Stalin, or the social-reformist and anti-Communist forces? Trory's book reveals our obscured and terribly caricatured world presented by the vaunted "information revolution," with clarity and penetration. He takes the reader through ten chapters, 250 pages of materials from 1952 forward to 1960. Warning that this requires patient study, Trory states (page 250) that: "...whether Khrushchev was conscious of his role or not, the fact remains that his attacks on the Marxist-Leninist policies Stalin successfully pursued up to the time of his death, created the break that led to the unraveling, albeit temporarily, of the Socialist system of society we had hitherto considered to be irreversible,... the continuation of the period leading to the "collapse" and (without which) it will not be possible to formulate correct policies needed to meet the present situation." We are all indebted to Trory for his fine work, and there are appendices at the end of his book. We are encouraged and stimulated that somewhere now in his fifth score of years, Ernie Trory continues his exemplary work. That in itself is inspirational. Trory's latest book is available to order from Northstar Compass; the price is $25.00. 280 Queen Street West, 2nd fl.